Kyary Pamyu Pamyu, the cherubic Japanese pop star behind some of the world's most bizarre music videos, performed in New York for the first time this weekend. Read a review of that concert here, a sort of candy-high victory dance with her diehard fans. We met up to talk before the show while she was surrounded by a solid entourage of 20, including photographers and a film crew (as is presumably a common occurrence), as well as Yusuke Nakagawa, the head of famed Harajuku management group Asobi System. We conducted the interview in Japanese, translated it and presented it below in both languages. (日本語バージョンはページ下部にて！) Kyary spoke about going global, admiring Katy Perry, working with J-Pop mastermind Yasutaka Nakata and her crazy fans. Since the tour started, you've been to 10 countries and 20 cities. How has it been going? At first, I was worried that people wouldn't know me, or even if they did know me that only core Pamyu Pamyu fans would come. But surprisingly, most places sold out. In Europe, the energy was mechakuha [crazy] high, and when I played in LA and New York, people learned the dances and lyrics, even though it's in Japanesssss!! I really felt like we were all connected. It was really fun! Are the audiences different than in Japan? Yeah, totally different! Many Japanese people are really shy and they don't dance and sing with me. But outside of Japan, even though people can't understand what I'm saying, they always dance and sing, and that makes me really happy. Do you make your music for a Japanese audience or for a global audience? At first, I didnt think about global markets at all. But even in Japanese, my lyrics don't make any sense and have a kind of mystery, like on "Pon Pon Pon" and "Tsukema Tsukeru." I can feel that what I'm doing in Japanese is catchy to global audiences anyway. Has doing a world tour changed your goals for your music? It has! This tour is my first world tour, and I felt a lot of excitement from the audiences overseas. People really welcomed me everywhere, so now I want to be an artist who can play music more globally so I can come back again and again. What is it like working with Yasutaka Nakata, your writer and producer? Actually, he told me that he really wants to see my show in New York. He came to New York just to see my show, so I'm pretty nervous and I will try my best for tonight. I hope he likes it. I have been a big fan of his music—like Perfume, Meg and Capsule—since before my debut, so now I just feel like my dreams have come true. What is he like in the studio? Nakata-san writes my all songs and lyrics. When he is ready, he calls me and says, "Come to my studio to record some vocal parts." In the studio, he gives me some new song that I've never heard, and I always have to memorize the lyrics in five or ten minutes and immediately start recording. It's really, really hard! How is your music related to the other bands that he produces? I think they are totally different. Perfume always sounds like innocent girls who fall in love with someone with pure heart, and Capsule is kinda diva. Mine has many strange words and mystery words, which is why I have a lot of really young fans, too. My fans are totally all ages. Do you contribute ideas for the music? Nakata-san totally understands what I like, so he always says, "I tried to make those songs so you will like them," and brings me some new songs for the album tracks. Most of my songs were born out of everyday conversations. It's really instinctive. For example, "Tsukema Tsukeru" comes from when I put on false eyelashes and say "tsukema tsukeru" unconsciously. He said, "I got this phrase!" It's something like that most of the time. Your music videos often make scary things seem cute. Why? I love grotesque things. My concept is scary things that become traumatic with their cuteness. There are so many "just cute" things in the world, so I add grotesque, scary and even shocking materials like eyeballs and brains to balance out the cuteness. What actually scares you? I'm not really scared of anything, like ghosts. I think real humans are more scary, like stalkers and crazy fans. Do you want to work with American music producers? I want to go for the global music scene for sure, but I want to bring the world what I am doing right now. I believe my music doesn't have a language barrier. People can sing my songs even though they aren't Japanese, and the dances are easy to learn. If my songs were in English, they would be totally different! But in the future, I want to do collaborations with my favorite American artists. Who are some of your musical inspirations? When I was a kid, I listened to Morning Musume [one of the biggest Japanese teen idol girl bands]. Since I was interested in fashion, I got inspired by Gwen Stefani, Katy Perry and Lady Gaga, because they have great music and fashion together. Who gives you inspiration for your clothes? Lady Gaga and Katy Perry give me inspiration all the time, for clothes too. Gaga is more high fashion and Katy has more cute things, like macaroons and candies, so I feel we have kind of the same sense of fashion. I'm always inspired by her style, and I heard they love Harajuku stuff too. How did you get the confidence to start dressing so boldly? 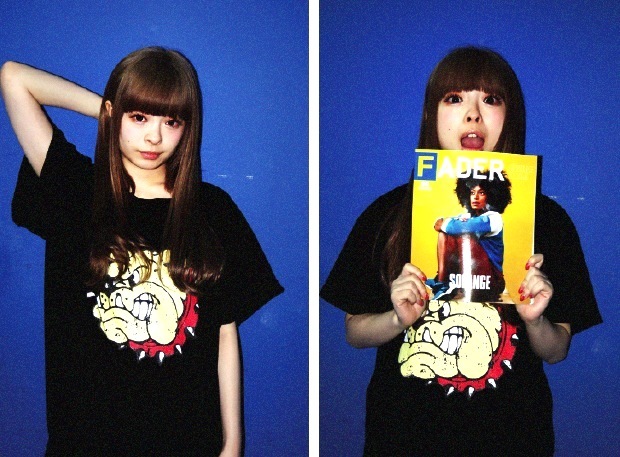 We have Team Kyary, which has hair stylists, designers, stylists, make-up artists, etc. and me. We have worked together since my first music video, "Pon Pon Pon," so it's all about the team. Whenever I have some new ideas, we talk about them as a team. Everything comes from that kind of team process. What advice do you have for people who feel timid about fashion? I don't really understand why they are scared of trying new things. I think they should try everything once, and if it's not really suited for them, then they should try something else. It's not only about fashion: challenging yourself is the most important thing!